Ruling and opposition parties on Tuesday struck an agreement over the formation of the parliament's new leadership and its standing committees, ending more than 40 days of legislative void. 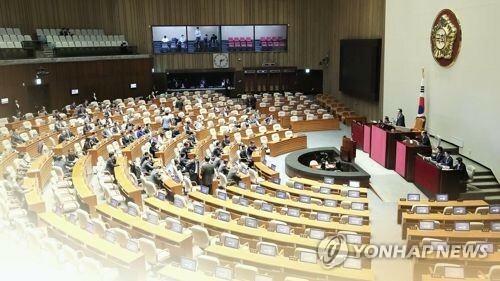 After grueling negotiations over who would chair key committees, the floor leaders of the ruling Democratic Party, main opposition Liberty Korea Party (LKP), Bareunmirae Party and the Parliamentary Group for Peace and Justice (PGPJ) announced their agreement for the second half of the 20th National Assembly's four-year term. Under the deal, a member of the ruling party, the largest party in parliament, will become the parliamentary speaker, while the LKP and Bareunmirae Party, the second and third largest parties, will get the vice speaker positions. The parties will hold a parliamentary plenary session to elect the new Assembly leadership on Friday. In May, the ruling party picked six-term lawmaker Moon Hee-sang as its candidate for speaker. Of the 18 standing committees, ruling party members will chair eight, while the LKP, Bareunmirae and PGPJ will lead seven, two and one, respectively. In line with the parliamentary customs, the ruling party will lead the house steering committee, while the LKP will lead the legislation committee. The parties agreed to form a taskforce to further discuss ways to prevent the legislation committee from wielding excessive legislative authority, a major sticking point during the negotiations over the parliamentary formation. Apart from the steering committee, the ruling party will assume chairmanships of the committees on strategy and finance; national policy; science, ICT, broadcasting and communications; defense; and gender equality and family. The LKP members will head the committees on budget and accounts; land infrastructure and transport; foreign affairs and unification; and environment and labor. The Bareunmirae Party will lead the intelligence committee, while the PGPJ will chair the committee on agriculture, food, rural affairs, oceans and fisheries. The parties also agreed to separate the large committee on education, culture, sports and tourism into two separate ones -- one in charge of education and the other the remaining affairs. They will hold a floor session on Monday next week to pass a revision to the National Assembly Act to enact the separation. Also on Monday, the parties will elect the chairs of the committees, except for the education and culture committees, whose chairs will be elected on July 26. In addition, the parties agreed to establish six special panels on ethics, political reform, inter-Korean economic cooperation, judicial reform and the fourth industrial revolution. The panels are to run until the end of this year. Meanwhile, earlier in the day, the parties agreed to convene an extraordinary session of the National Assembly starting Friday for a 14-day run.